If you lost a bird, read our tips for Finding an Escaped Bird. If you see someone's lost pet bird, read our tips for Recovering Someone's Lost Bird. If you have found a wild bird, read our tips for Wild Animals in Distress. If you have found a sick or injured bird, please deliver the bird to your nearest Animal Care Services. Please direct any questions or comments about the listings below to lostandfound@mickaboo.org. Click here to see our "found bird" listings. Welcome to Mickaboo Companion Bird Rescue Lost and Found. This page is currently under construction. For additional listings and daily updates please visit our Lost and Found Facebook page Mickaboo Companion Bird Rescue Lost and Found of Northern California Facebook Pagehttps://www.facebook.com/mickaboolostandfound/ a place to post and search for the lost and found. Thank you! years old, again my number is 650-728-2168 and I lost her. On June 6th, 2017. I'm still looking. Thank you. Message from Mickaboo Lost and Found, Please help share this information! Thank You! 11/22/16 Castro Valley CA Moxie" is a Jenday Conure who was last seen in Castro Valley near the high school on 11/22/16. She is about 9 inches from head to tail. Her head and chest are bright orange and red. Her wings, back, and tail are dark green. She is a VERY friendly bird and loves people and may fly to you if called. She is very loud (true Conure :) ). Please call Athena 510-825-9549 if found. Lost my male cockatiel (image attached) on 5/28/16 at 10 AM near Reed Avenue in Sunnyvale. Last heard near Sugarpine and Lily by Ponderosa Park. If you have seen, heard, or have him please contact immediately at 408-891-0472. His name is Tony and he does not have a leg band. Note - if you have seen him anyway to lure him in is with a mirror ( he loves to stare at himself). Colors - Gray Body with slight white on wings, yellow head/crest, and two orange spots on both sides of his. Thank you!! 9/18 Half Moon Bay CA; Lost We lost our small parrot Pauly. She is a White headed Pionus, her size: not very big, about one foot. 9/8 Santa Rosa CA: Lost blue and white Parakeet with black spots:Cross street Brookwood and Sonoma. Her name is "Blue". She is finger tame and will come to your finger when given a minute while her name is repeated. She also likes landing on baseball caps. She got out of the house at 8:30am Tues Sept. 8 Mark and Jen Please call us at (707) 573-0344 info if you see her. We will be checking our phone frequently for the next few days. If you see her you don't need to try and get her. Starting Thursday Sept 10 you can call my cell phone if you see her (707) 331-4805 (Mark). 8/21 San Jose CA: STILL LOST COCKATIEL: auto transcribed. Hi, my name is Swati, and I'm calling from San Jose, California. This is regarding a lot of pain, she flew away Sunday, September. I mean august 21st and we have been trying to search for her so just wanted to check if somebody has turned her in San Jose, since Sunday or anybody has brought one in. call at 408-674-7507. Thank you. 8/23 Los Altos Hills STILL LOST! Lost African Grey Last seen in vicinity Central Drive, Los Altos Hills. Near Foothills Park 8/15 He is 5 years old, medium/large size Parrot, about 11'' tall, grey color feathers & red tail. He was due for wing clipping so at this time he is flight capable. His name is Jack. He speaks and says things like "Hello", "Tucker, get out of there" or "Gracie girl" Please contact Eric 408-489-6044 or Cheryl 650-996-0470 Please help share this information! 8/21 San Francisco CA, reposting STLL LOST: Hello, I lost my parrot African Grey. His name is Kesha, he is talking Russian and English. 6/22/15 Carmichael CA: Lost lovebird (pastel yellow, blue & white lovebird) my daughters lovebird got out from cage I'm in carmichael Markley /ogilby /madison citrus heights .His color is yellow with bits of blue he's name is Baby if found please please give us a call 916-410-1136 he's missed. He will not survive being in a cage all day he's used to being out flying around the house. Reward more than the cost of Bird My daughter goes to bed crying every night please call if found. Thank you. 6/19/15 Fairfield CA: LOST COCKATIEL BIRD-REWARD (Fairfield, CA) Flint Way at Buckingham Ave. Cockatiel lost at 1349 Flint Way in Fairfield on 06/19/2015 while at a pet sitter's house. He/she escaped from his/her cage. The bird's name is Frenchie and has been a family pet for three years. He/she has a distinct repertoire of songs, including a "family whistle," which we have recorded. Please call us if our Frenchie has come into your yard or if you have been able to capture the bird. Bob or Diana at (707) 446-6527, (707) 761-9257 or (707) 344-4219. Thank you so much! 5/8/15 REUNITED- Alameda CA: Lost African Grey Congo: Hello, this is Diane Goldman. My telephone number is 510-521-4557 My email address is D, as in dog B, as in boy, E G, as in George 14 at Comcast. Dot Net. I live in Alameda, and I wish to report the loss of my beloved. Congo African Grey. She is Leg banded, she's fully flight it. She's DNA tested. Doctor Speers is her Vet and she's been missing since the 8th her name is Carley, she is my beloved. If anyone has found her please let me know. 5/22/15 San Rafael CA: My blue crown conure flew out of his aviary inside my garage on Friday, May 22nd in San Rafael, Santa Venitia Neighborhood near china camp. rescue groups and vets as possible. I will design a flyer today so that I can post in vet's office or email. His name is Jo, or Jojo. Thank you for noting it, and let me know if I should do anything else? My daughter goes to bed crying every night please call if found Thank you. 5/11/15 Carmichael CA: STILL LOST LOVE BIRD my daughters lovebird got out from cage I'm in carmichael Markley /ogilby /madison citrus heights .His color is yellow with bits of blue he's name is Baby if found please please give us a call 916-410-1136 he's missed. He will not survive being in a cage all day he's used to being out flying around the house. Reward more than the cost of Bird. My daughter goes to bed crying every night please call if found, Thank you. 4/2/15 Sacramento CA Lost Congo African Grey Parrot (med/large parrot, grey and white with red tail) http://sacramento.craigslist.org/laf/4962661451.html Ricky flew off April 2, at 3 p.m. from our backyard. We are located at Coppertree Way and Pasadena Ave. Sacramento 95821. He flew east. He is a regular sized Congo African Gray Parrot with a red tail and all gray body, and no toes. He doesn't have a band on and no chip. He is fully feathered and is not clipped. He is tame and talks. He responds to hello, whoo who, and to his name (Ricky), We have had this "rescued" bird 3 years and he is a very important part of our family. He is used to being around small dogs, cats, women, men and children. He needs meds and is on a special diet. Theresa 916 972 9805 if you can help search or are available to help post flyers your help would be appreciated. 9/13/14 Granite Bay CA *** REWARD ***Lost African Gray Parrot Please help me find Fozy! He was lost on 9/13/14. LARGE REWARD for returning or helping reunite Fozy with his family! Fozy is a 2-year-old African Gray Parrot. Fozy is about 12 inches with a light gray feather, whitish belly and a red tail. My heart is truly broken without him. He likes nuts especially Almonds, cookies and treats. . .. He is very friendly but shy at first. Please, if you have ANY information contact me immediately -- no questions asked. I just want my baby home. IF YOU SEE OR FIND HIM PLEASE CALL (916) 872-7374 ASAP. Thank you very much! 9/23/14 San Francisco/Mission District CA: LOST COCKATIEL Have you seen Bodhi? Yellow & gray cockatiel with bright orange cheeks. Got out the back door & flew away - near 22nd and Florida. I will gladly give a reward for anyone who helps find her. Thanks! 9/23/14 Pleasant Hill CA: Lost Cockatiel, We lost our loving bird this morning around 9am. She flew away from the balcony. Her name is Cookai and she is very friendly. This is her second time leaving us. Please contact us if you find her kindly. She must be very scared. 9/16/14 Santa Rosa CA: lost parakeet, budgie We are still looking for our beloved bird. He is gray with a white head. He was last seen at the corner of Tachevah and Mesquite in Bennett Valley on Tues 9/16. A neighbor thinks he heard him that night further down toward the far end of Mesquite park. He's a singer, so you might hear him. His song is pretty unique. We miss him so much. 9/27/2014 Sacramento CA: (south) LOST WHITE COCKATOO NAMED SNOWY NEAR FLORIN ROAD ON 9/27/14. FLORIN ROAD at 25TH STREET Contact: Sang 916-276-6732 SNOWY WILL BE SHY AT FIRST, CLICK ITS BEAK, OR EVEN SQUAWK IF FELT THREATENED. SHE IS ABOUT 10 YEARS OLD, ABLE TO TALK, AND A REALLY CUDDLY BIRD. PLEASE HELP FIND MY LOST FAMILY MEMBER! 8/22/14 Sacramento CA: (valley hi park area) REWARD FOR PARAKEETS. https://www.facebook.com/mickaboolostandfound/ a place to post and search for the lost and found. Thank you! Hi- a parakeet flew into our garage yesterday and we kept it overnight. 9/18 Los Gatos CA: Found (2) Conures http://sfbay.craigslist.org/sby/laf/5227581877.html reply to: gv67n-5227581877@comm.craigslist.org A nice man found 2 conures today at the cemetery on Los Gatos Almaden Rd. They are friendly little birdies but with very distinct features. They are safe. This nice man called us a parrot rescue and we came out and picked them up. They are safe and being held at our home on quarantine. Please contact us if you think they might be yours. Like I said they have some very distinct features please be prepared to describe. 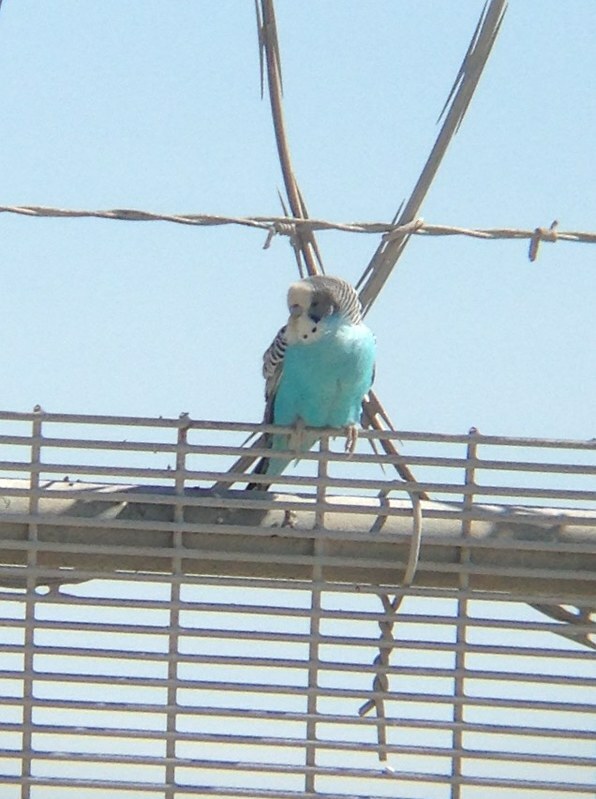 9/9 Silicon Valley/Santa Clara CA: Shelter Notice (10) Budgies (1) Finch. Please contact Humane Society Silicon Valley at 408-262-2133 ext. 110 or via email customer_care@hssv.org if this may be your pet. Reference animal ID for the corresponding bird below. a:119848 b:119847 c:119846 d:119844 e:119843 f:119842 g:119845 h:119841 i:11984 j:119839 k:119855 pictured https://www.facebook.com/mickaboolostandfound If you have any questions or think you may recognize any of the animals listed, please give HSSV a call at 408-262-2133 ext. 110 or email at customer_care@hssv.org. 9/7 Elk Grove CA: Found Cockatiel. Anyone lose a pet bird? Found at the corner of Rising and Alta Mesa in Wilton. Very friendly and sweet. Just dropped it off at Bradshaw Vet. Please call 916-685-2494 to claim it. 7/9 Moraga CA: this was posted on our neighborhood Next Door Neighborhood site Found Parakeet on July 9th in front of JM. Found Parrot - Last Call: Hello this is the last post for a found African grey parrot. It flew into our back yard and decided my dad was his mama bird. We have been fostering the parrot for over a month and can officially keep him if no one steps forward. We would love to get him home, but have no problem providing one. If you have lost a parrot contact me to see if this is the one. 5/23/15 Yolo County/Woodland CA: Shelter notice This BIRD - ID#A134662 (no pic) I am a brown Finch.My age is unknown. 5/23/15 San Francisco CA: SFACC Shelter notice: This BIRD - ID#A372303 I am a gray Finch. (no pic) My age is unknown. 4/23/15 Lake Forest CA: Macaw sighting: SOUTHERN CALIFORNIA SIGHTING NOW 1pm There's a “large" red Macaw (GREENWING MACAW) with bluish on his wings" spotted in Lake forest ca, near Rockfield and Lake forest...He was just sitting on a rail at the local Del Taco"""" if this is your bird or if you can offer assistance please GO TO LOCATION provided above. No contact info. 4/22/2015 Morgan Hill CA: FOUND- PARROT Came home tonight to find a big old parrot sitting on my back porch railing. I am sure it was attracted to the calls from my birds. I was able to put an empty cage outside and the parrot is now safety closed up in it and quarantined to the back sunroom. I DO know what breed of parrot it is but in the past have had bad experiences with putting the breed up. I don't want people emailing me and lying! So, if you have truthfully lost a large parrot shoot me an email and let me know what you lost and some identifying things about your bird. I'll keep it for a little while so that hopefully its family will be able to bring their feathered kid back home. 4/13/15 Roseville CA, Found Moustached Ringneck. Not banded, found in golf course area. Contact Person: Freddie 916-289-9883 (found April 13-15) Grey head, pink near chin, black (eyebrows & mustache) pink at upper chest, green body & green wings, black beak. Beautiful exotic. 3/10/2015 Sonoma Found Cockatiel: Hello! I have a young, perhaps barely a year old, I believe, Cockatiel that was found in Sonoma. I was contacted by the school where the bird was found Tuesday, March 10th and I came with a cage and now am caring for him. I believe the bird is a young male. He is not tame and is fearful of hands. I am working on his fearfulness. Just this past Friday, the 13th, I was contacted by someone who saw my posting on Craig's List lost and found who said they lost a young bird and its mother 2 weeks ago but never called back. If you think this is your bird please contact Cynthia at byerbird@icloud.com Thank you! 3/22/2015 Sacramento CA: Found Cockatiel outside of Walgreen's on Broadway & 14th st. Please call 916-417-7926 if he's yours, would love to reunite him with his family. Will ask for physical description to confirm ownership. Broadway at 14th St.
3/22/2015 Oakland Found Parakeet (blue) Found on Sunday 3/22 at 6:30 pm Location found 8011 Skyline Blvd. Oakland CA. Bird is banded with letters starting with BBG contact: Yasemin D.yasemind@gmail.com blue with white head with variegated black and white stripped back. *Update: 2/11/2015 Red Macaw is now in San Diego main shelter (opens Tuesday) I was found in zip code 92107. I'm a RED MACAW. I'm in the San Diego Region shelter. I entered the shelter on 2/9/2015, My ID number is A1632521, My kennel number is C600. 12/23/2014 Fremont CA: Shelter This BIRD - ID#A129668 I am a blue and white Parakeet. My age is unknown. 9/22/2014 San Francisco/Potrero Hill CA, Hi there, I found a yellow budgie on the ground while running through a part of Potrero hill tonight (9/22) in San Francisco. Its wings have been clipped. I am ok to take care if it in the short term (I have had a budgie before), but I would appreciate having a notice put up on your website in case anyone is looking. They can contact me at greypearl@gmail.com. with a description of your lost and contact info, Help is needed in capturing if this is your bird! Phone Number: (916) 764-0237 Hello, I left a voicemail today regarding an Eastern Rosella that we found in our yard. We live in the Sacramento area and we are not able to find the owner through the number listed on his leg band. We are going on vacation next week and would like to find his owner. Please Visit Mickaboo Companion Bird Rescue Lost & Found of Northern California Facebook page for additional posts and daily updates https://www.facebook.com/mickaboolostandfound Thank you! 5/25/2014 Hayward CA, Green Rosella Parrot sighting, seen around Turner Street and Copa Del Oro Drive in trees, Hayward.